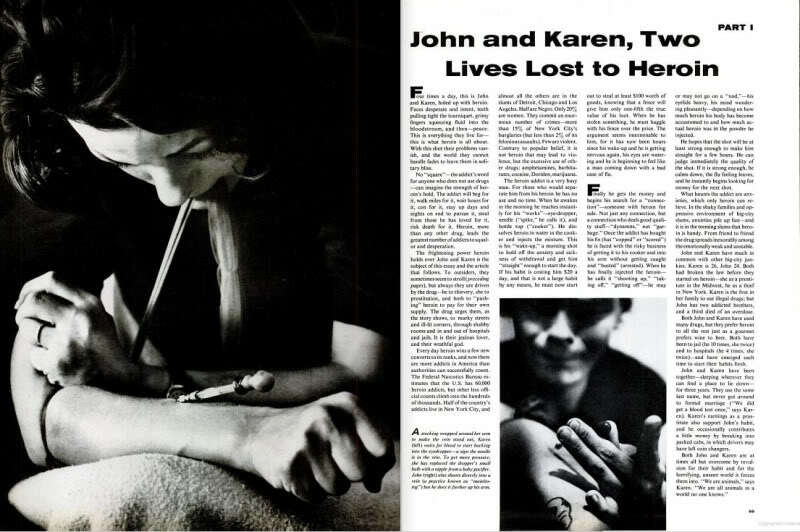 "Photography has witnessed other, now-classic depictions of junkies, like Bill Eppridge’s “John and Karen, Two Lives Lost to Heroin,” published in LIFE in 1965, and Larry Clark’s landmark Tulsa (1971), in which the photographer’s portraits of his friends — and himself — formed a poignant picture of lost American youth." "With "Needle Park," Bill gave us one of the most powerful and memorable photographic essays Life ever published, one still highly regarded today. The story was to run in two parts, the first focusing on an addicted couple to give the nation's narcotics problem a human face, the second to explain what was being done to treat it. Research to find the ideal subjects for the story was almost as intense as the actual shooting. 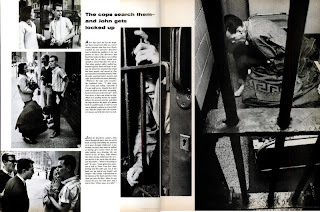 Weeks spent with the detectives of New York City's Narcotics Bureau were followed by months of "hanging out" in "Needle Park," on the street corners where connections were made, and in the fleabag hotels where the heroin was shot up. 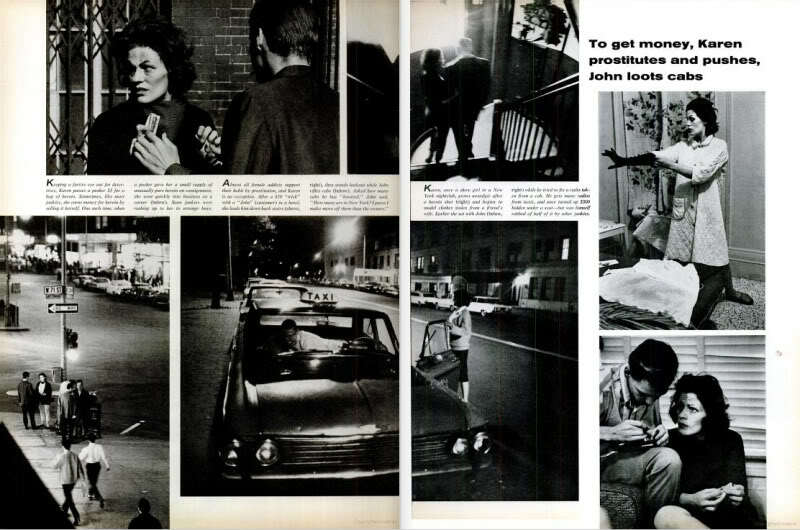 That the couple, Karen and John, were white was deliberate; it was not to be a race story. 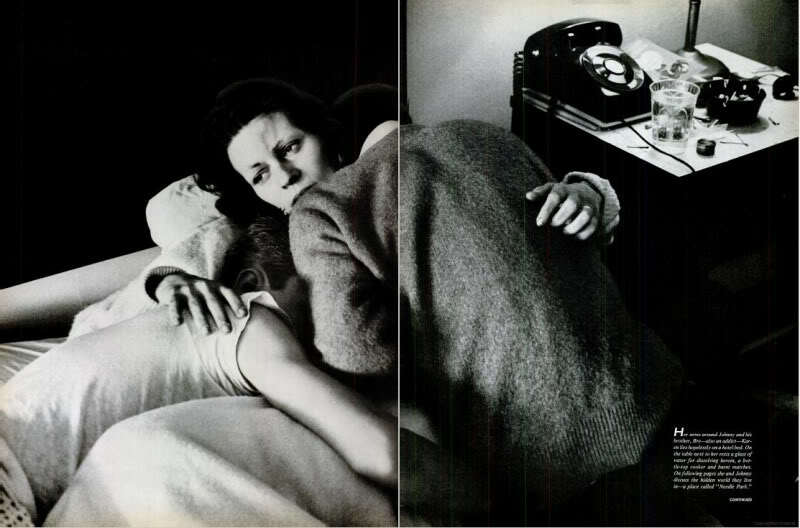 Trust, between subject, photographer and magazine, was essential. It helped that Life had a reputation for being respectful and fair. 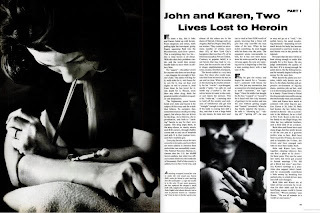 Of Karen and John, writer Jim Mills found that "intellectually, they committed themselves very quickly, but the emotion okay came gradually over a period of weeks." 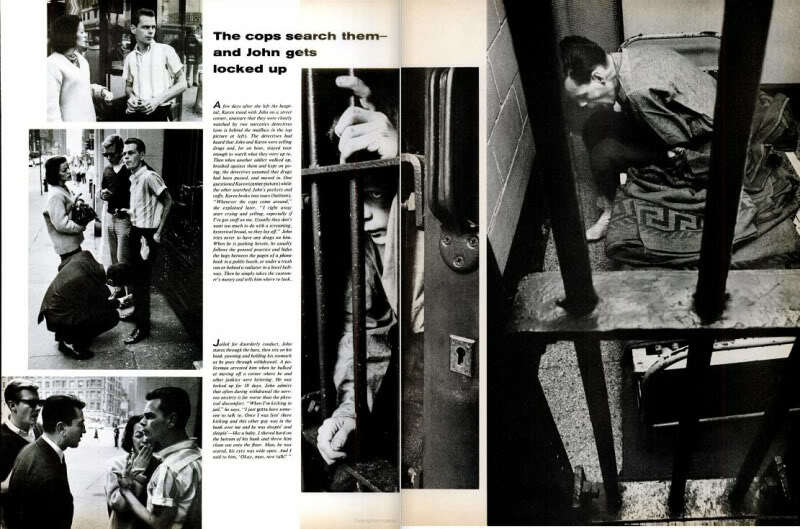 Bill and Jim earned that "okay" by living the addicts' life. Bill blended into the scenery, his presence often forgotten, his photographs taken with available light – he may have missed a few, but he probably gained much more. So convincing was Bill that he was picked up by the cops who thought that he had stolen his cameras and Life credentials. He also had some explaining to do to many of the magazine's readers who believed that the photographs were too real; they must have been faked. The story complete, Bill, Jim and Life did what they could to find for Karen and John long-term care by a psychiatrist who specialized in drug addiction. 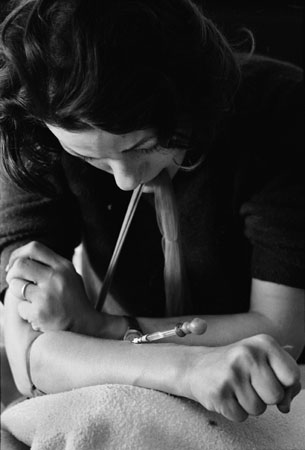 The sensitivity that was necessary for Bill to photograph them assured that he would remain interested, but it isn't easy to keep track of addicts battling a devastating habit. And caring – about a subject, about your pictures – takes a toll. In fact, Bill worries all the time: "They'll pay you for one day's worth of work," he says, "but it's usually about three. One to worry, one to shoot and then, one to recover." 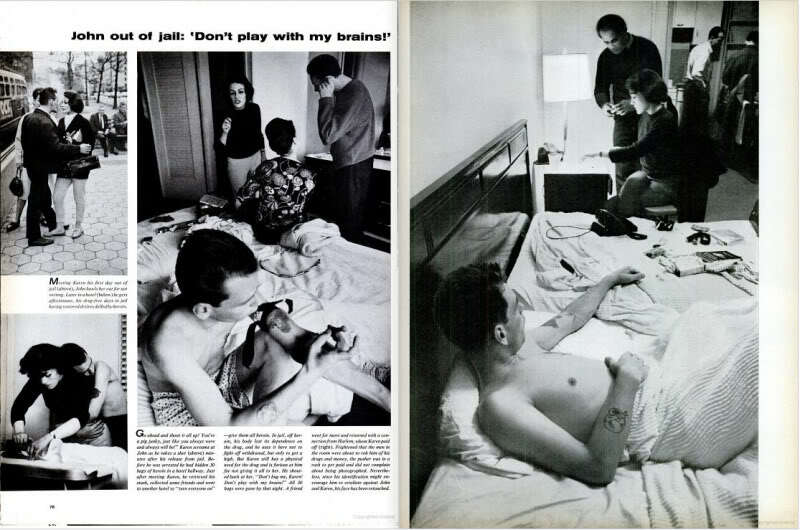 Article by James Mills and photos by Bill Eppridge for Life Magazine, February 26, 1965. Amateur and professional photographers invited to submit original landscape-themed photos for second annual photography competition. Winners to receive photo publication, cash awards, and more. "The Georgia O’Keeffe Museum is excited to invite photographers to submit their favorite images of landscapes,” said Robert A. Kret, Georgia O’Keeffe Museum director." The Georgia O’Keeffe Museum is pleased to announce the second annual photography competition for 2013. To celebrate O’Keeffe’s enduring artistic legacy, this year’s theme honors landscapes, one of O’Keeffe’s most iconic and beloved subjects. Both amateur and professional photographers—located regionally, nationally, and internationally—are encouraged to submit their original images for a chance to win prizes and to be recognized for their talents. "The Georgia O’Keeffe Museum is excited to invite photographers to submit their favorite images of landscapes,” said Robert A. Kret, Georgia O’Keeffe Museum director. “It is an honor to reward their talent and creativity as a tribute to our namesake, Georgia O'Keeffe." First, second and third place winners will be awarded in the adult category for entrants aged 21 years and older. The photography competition will also include two student competitions, one for students 18-21 years of age and a second competition for students under 18 years old. The Museum will also announce 20 honorable mentions. Photos may be submitted any time between today and the final entry deadline on Thursday, November 14, 2013, the eve of Georgia O’Keeffe’s birthday. Entrants are encouraged to submit their photos before October 15, 2013 to take advantage of reduced early entry fees. The theme of the Georgia O’Keeffe Museum’s 2012 first annual photography competition was “flowers.” A total of 930 entrants from 17 countries submitted a grand total of 3,380 images. The winning photograph, “Dancing Tulips,” was submitted by Joanna Stoga of Wroclaw Poland; the remaining winners hailed from New Mexico. Adult group judges: Jolene Hanson, director and curator of G2 Gallery; Eddie Soloway, photographer; and Amy Silverman, photo editor of Outside Magazine. Student contest judge: Sarah Zurick, education and family programs manager of the Georgia O’Keeffe Museum. $500 cash-prize; a Santa Fe Photographic Workshops Intensive; a book of exhibition paintings and photographs titled O'Keeffe and New Mexico: A Sense of Place which includes essays by Barbara Buhler Lynes and by the well-known writers Lesley Poling-Kempes and Frederick W. Turner; a copy of Georgia O'Keeffe in New Mexico: Architecture, Katsinam, and the Land, an exhibition catalogue which reveals the little-known breadth of Georgia O'Keeffe's interest in northern New Mexico and illuminates her keen sensitivity and deep respect for the Native American and Hispano cultures of the region; and a select item from the O’Keeffe Museum Shop. $300 cash-prize; a book of exhibition paintings and photographs titled O'Keeffe and New Mexico: A Sense of Place which includes essays by Barbara Buhler Lynes and by the well-known writers Lesley Poling-Kempes and Frederick W. Turner; a copy of Georgia O'Keeffe in New Mexico: Architecture, Katsinam, and the Land, an exhibition catalogue which reveals the little-known breadth of Georgia O'Keeffe's interest in northern New Mexico and illuminates her keen sensitivity and deep respect for the Native American and Hispano cultures of the region; and a select item from the O’Keeffe Museum Shop. $200 cash-prize; a book of exhibition paintings and photographs titled O'Keeffe and New Mexico: A Sense of Place which includes essays by Barbara Buhler Lynes and by the well-known writers Lesley Poling-Kempes and Frederick W. Turner; a copy of Georgia O'Keeffe in New Mexico: Architecture, Katsinam, and the Land, an exhibition catalogue which reveals the little-known breadth of Georgia O'Keeffe's interest in northern New Mexico and illuminates her keen sensitivity and deep respect for the Native American and Hispano cultures of the region; and a select item from the O’Keeffe Museum Shop. $100 cash-prize; a book of exhibition paintings and photographs entitled O'Keeffe and New Mexico: A Sense of Place which includes essays by Barbara Buhler Lynes and by the well-known writers Lesley Poling-Kempes and Frederick W. Turner; a copy of Georgia O'Keeffe in New Mexico: Architecture, Katsinam, and the Land, an exhibition catalogue which reveals the little-known breadth of Georgia O'Keeffe's interest in northern New Mexico and illuminates her keen sensitivity and deep respect for the Native American and Hispano cultures of the region; and a select item from the O’Keeffe Museum Shop. Photo submissions will be posted to the Georgia O’Keeffe Museum website. 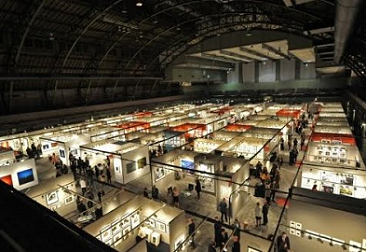 World's leading photography art galleries to exhibit at The AIPAD Photography Show New York, April 10-13, 2014. More than 80 leading photography art galleries will present a wide range of museum-quality work, including contemporary, modern and nineteenth-century photographs, as well as photo-based art, video, and new media, at the historic Park Avenue Armory in New York City's Upper East Side. For more information, visit www.aipad.com. Hear from leading curators, dealers, artists, critics, and journalists . Photographer, author and educator Nina Berman is known for her work photographing wounded American veterans including her 2006 “Marine Wedding” image. Presenting selections from work made since 9/11, she will explain her motivations and approaches to photographing war on the domestic front. "What do cameras and combat have in common? Neither seem to be going away"
What Do Cameras And Combat Have In Common? "For me it's about the impact of war as it relates on a very basic human everyday life," says New York-based photographer Nina Berman, who has been photographing wounded veterans since 2003. Her image titled "Marine Wedding," made in 2006, captures a moment between Marine Sgt. Ty Ziegel and his bride on their wedding day. Ziegel was seriously wounded by a suicide car bomber in Iraq and spent 19 months in recovery. "In that moment I saw a shellshocked couple," says Berman. "That is what war does. It disturbs, distresses and changes the normal lovely course of life." 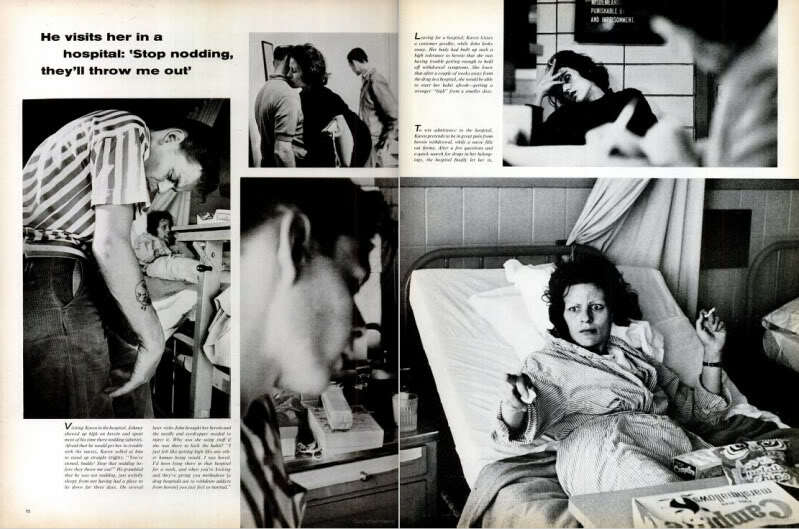 The image itself has had a life of its own, garnering Berman a World Press Photo Award and launching Ziegel into the national spotlight to discuss the failures of veteran care. 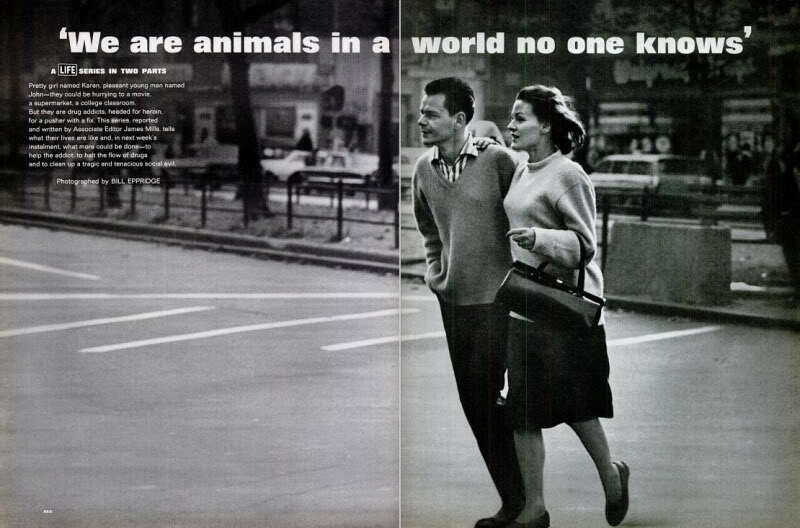 Years later, Berman sees the image as less about the couple and more of a symbol of the impact of war. "I think that people can be taken aback by how [Ziegel] looks," she says, "but there are a lot of people that look like him. He wasn't a freak, an anomaly; that's what this war has done. People who would have died are surviving. That is the reality." Berman's voice shuddered as she spoke about Ziegel's passing late last year. She says she often wonders: What does it all amount to? If you strip war of its historical and political context, it seems, what you are left with is simply to wonder: Why has war been a constant throughout human history? WEDNESDAY, JULY 10, 7:30 - 10:00 P.M. Ticket includes admission and a free Brooklyn Brewery beer. ( Reporters Instructed in Saving Colleagues). Ticket price is $15.00. To purchase a ticket, go here. 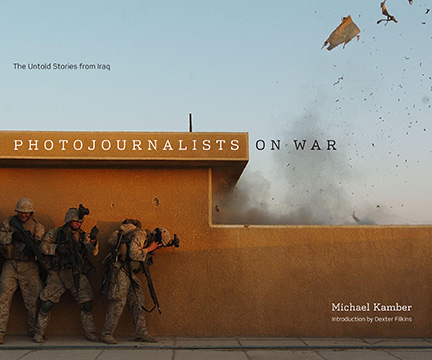 With never-before-seen work from the world's top photographers, Michael Kamber's new book Photojournalists on War: The Untold Stories from Iraq (University of Texas Press) features a groundbreaking visual and oral history of America's nine-year conflict in the Middle East. Influenced by his own experience as a multimedia pioneer, Kamber set out to interview photojournalists from leading news organizations including Agence France-Presse, the Associated Press, the Guardian, the Los Angeles Times, Magnum, Newsweek, The New York Times, Paris Match, Reuters, Time, The Times of London, VII Photo Agency, and The Washington Post. In his book, he recounts their first-person, frontline reports of the war as it unfolded, including key moments such as the battle for Fallujah, the toppling of Saddam's statue, and the Haditha massacre. These hard-hitting accounts and photographs reveal the inside and untold stories behind the headlines in Iraq. On July 10, Brooklyn Brewery founder and former AP foreign correspondent Steve Hindy will interview Kamber about his career and his mission to create the most comprehensive collection of rare eyewitness accounts of the Iraq War to date. Both men will reflect on the often shocking and sometimes heroic actions that journalists undertake in trying to cover the war, as they discuss the role of media and issues of censorship. The conversation will be followed by a book signing. Michael Kamber has worked as a writer and photojournalist for 25 years. Since September, he has worked primarily as a conflict photographer, covering a dozen conflicts, including Afghanistan, Somalia, Liberia, Darfur, and the Congo. Kamber worked as The New York Times' chief photographer in Baghdad in 2007, the bloodiest year of the Iraq War. He also covered Iraq for the Times in 2003, 2004, 2008, 2009, 2010 and 2011. As one of the first journalists to routinely file photography, video and written articles from overseas, Kamber helped pioneer the use of multimedia. Photojournalists on War is the result of a five-year oral history project documenting the role of photojournalism and the Iraq War. Kamber is the founder of the Bronx Documentary Center, and is the recipient of the World Press Photo, and many other awards. Steve Hindy is a former journalist and became interested in homebrewing while serving as a Beirut-based Middle East Correspondent for The Associated Press. He is a co-founder of The Brooklyn Brewery. "The function and mission of photography is to explain man to man and man to himself"
In 1955, Edward Steichen changed the world of photography forever. When the visionary curator and photographer decided to mount an exhibition to promote world peace and equality after two world wars, he was breaking the mould. He gathered 503 photographs of people from around the world, taken by 273 different (often unknown) photographers, and grouped them by theme. That exhibition, The Family of Man, opened in January 1955 at New York's Museum of Modern Art, where the Luxembourg-born Steichen was director of photography from 1947 to 1961. It went on to tour the world and become the most successful photography exhibition of all time – more than 10 million people have seen it. It will go back on show this weekend in a castle in Luxembourg, after renovation work that has taken three years. "Family of Man changed the way we view photographs today, and how we think about exhibitions," says Anke Reitz, conservator of The Family of Man in Luxembourg, where the collection has been since 1994. "It is a milestone in the history of photography." Steichen chose images grouped by themes intended to be so universal that anyone in any culture could identify with them: birth, fathers and sons, mothers and children, education, love, work, death and religion. The images were hung in particular formations, some dangling from wires overhead or attached to poles. The birth photos were arranged inside an intimate circular structure, while theatrical lighting created further drama and atmosphere. Steichen hung the photos without captions. "The exhibition was meant to be understood around the world without the need for words," says Reitz. Now, in its renovated setting in Luxembourg, The Family of Man is just as striking, dynamic and emotional as it must have been all those decades ago. The photographs are laid out precisely as in the original MoMA exhibition; only the lighting has been altered, for conservation reasons. Images of children playing and crying, men and women marrying, dreamily staring into space, dancing or fighting – including work by Dorothea Lange, Bill Brandt and Elliott Erwitt – are beautiful or intriguing. Others appear more as historic documents, such as the photo of crowds gathered in London for Princess Elizabeth and Prince Philip's wedding in 1947, or the image by Henri Cartier-Bresson of Gandhi lying in state in Delhi after his assassination in 1948. Sections of the show are now dated and gendered, and there is no doubt that the main worldview being expounded was white, western and male. One theme, "household and office work", shows only women cooking and cleaning, while the predominance of the nuclear family in many photographs, themes and arrangements feels reactionary and simplistic (as if the family could conquer all – even issues such as racism or social inequality). For Reitz, such criticisms are founded, but are "part of the history of the exhibition". The Family of Man is very much a product of its time and its creator, she says. As a contemporary viewer, it is hard to appreciate quite what an impact this anthropological photographic survey must have had, nearrly 60 years ago, when viewed in places as culturally diverse as Indonesia, Russia, Japan, Italy and Laos. "For many people, it was like seeing the world for the first time," says Reitz. "A lot of them didn't have TVs or access to magazines." The Family of Man has stood the test of time because of how innovative Steichen was as a curator. He displayed photos without frames and blew them up into lifesize formats; he took images away from museum walls and into the centre of rooms where visitors could interact with them. Not long before dying, Steichen said: "The function and mission of photography is to explain man to man and man to himself." That is the reason The Family of Man continues to capture our imaginations. 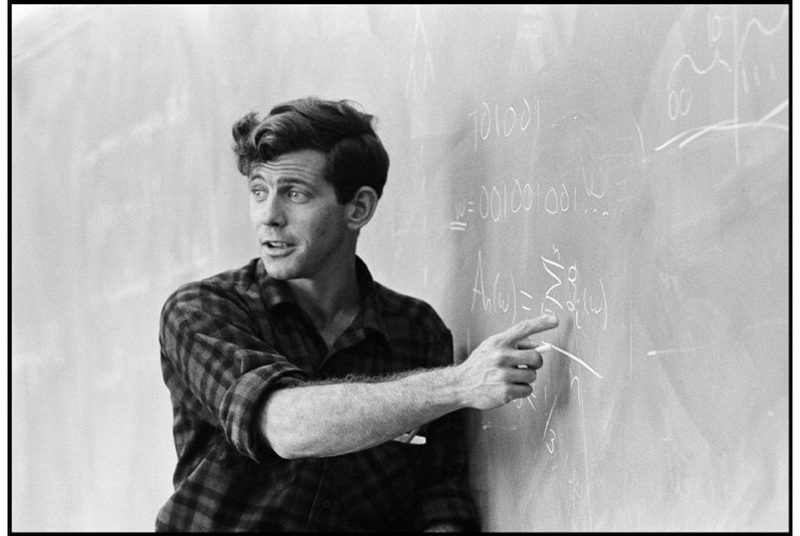 Michael Rossmann, an organizer for the Free Speech Movement at UC Berkeley, Berkeley, California. 1964©Paul Fusco/Magnum Photos. SANTA FE, NM.- Monroe Gallery of Photography, 112 Don Gaspar, is pleased to announce “Those Who Dared”, a major exhibition of compelling and provocative photographs depicting brave, courageous, intrepid, and audacious people and personalities that celebrates the human spirit of daring, drive, and determination to make a difference. The exhibition opens with a public reception on Friday, July 5, from 5 to 7; the exhibition will continue through September 22. “Those Who Dared” explores the characterization of extraordinary people who have influenced the course of modern history. The more than 50 photographs in the exhibit depict major personalities, historical figures, and everyday people who, through words, actions, and endeavors have made a difference; explored our world; made life-changing scientific discoveries, and inspired us all. These people broke records, broke ground, blazed trails, and suffered trials, shattering ceilings of glass and even tougher stuff. While some are obvious and some obscure, all acted to increase our liberty, safety, prosperity, and imaginations, often enduring an agonizing cycle of hope, progress, and crushing setback. Photographs depict people "who have dared", including: Amelia Earhart, Ann San Suu Kyi, Charles Lindbergh, Gandhi, Malcolm X, Martin Luther King, Nelson Mandela, Rosa Parks, Al Weiwei, Robert F. Kennedy, Eleanor Roosevelt, Indira Gandhi, Anwar Sadat, a lone protester stopping tanks at Tiananmen Square in Beijing, 1989, protesters in Tahir Square in 2011; Nobel Laureate Dr. James Watson, co-discoverer of the DNA molecule, Jonas Salk, discoverer of the first successful polio vaccine, astronauts; Albert Einstein, Simone de Beauvoir, Jean Paul Sartre, Muhammad Ali, Jackie Robinson, Cesar Chavez, Simon Wiesenthal, and many others. Photographers in the exhibition include world-renowned photojournalists such as Eddie Adams, Harry Benson, Bill Eppridge, Paul Fusco, Margaret Bourke White, Robert Capa, John Dominis, Alfred Eisenstaedt, Burt Glinn, Yuri Kozyrev, Carl Mydans, Martin Parr, Ken Reagan, Steve Schapiro, Jeff Weidner, and others. Monroe Gallery of Photography was founded by Sidney S. Monroe and Michelle A. Monroe. Building on more than four decades of collective experience, the gallery specializes in classic black & white photography with an emphasis on humanist and photojournalist imagery. The gallery also represents a select group of contemporary and emerging photographers. Apple Co-Founder Steve Jobs, California, 1982© Charles O'Rear/NGS. It's almost automatic. When locals think Fourth of July in Santa Fe, Pancakes On The Plaza comes to mind first. From the deliciousness of the pancakes to the cool cars on display ... from the toe-tapping music to the unique art show, Pancakes On The Plaza has something for everyone. And as it brings the communities of Santa Fe and Northern New Mexico together to celebrate our nation's birthday, the proceeds generated from Pancakes on the Plaza make a big difference in the lives of people in need. Then, stop in for an advance look at the exhibition "Those Who Dared" at Monroe Gallery of Photography. The gallery will be open until 3 PM on July Fourth, and please join us Friday from 5 - 7 for the opening reception.